Both of my girls have grown up with Leapfrog learning toys. For me, Leapfrog's unique blend of fun and education has, on many many occasions, been a trigger point for encouraging reading and interaction with books from a very young age. 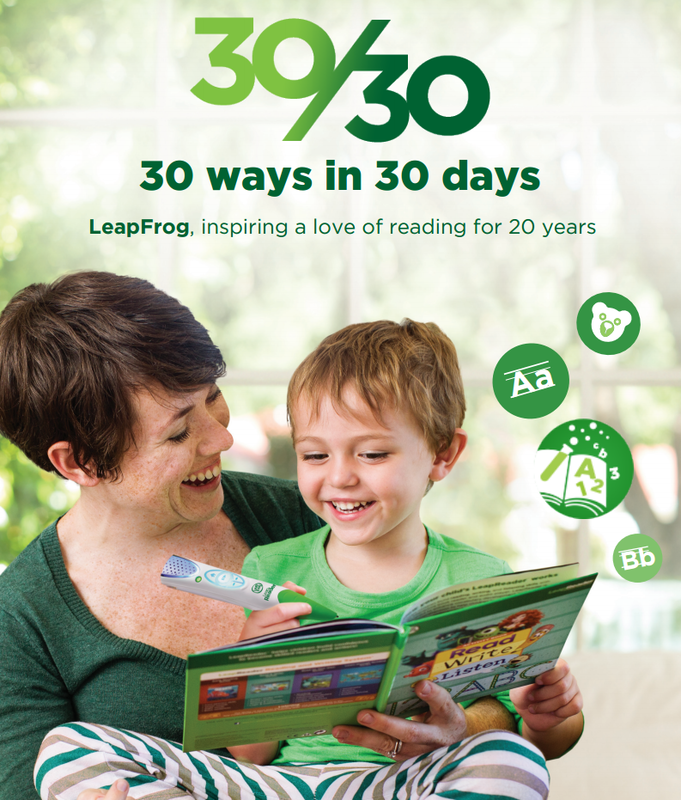 This week Leapfrog have launched their "30 Ways in 30 Days" guide in which educational expert Janette Wallis gives 30 daily tips and ideas of activities to try at home to help instill a life long love of reading. Holly is just 2 and yet she loves to sit and explore a book, either with an adult or on her own. She regularly uses her own Leapfrog Tag Junior Reader, or her sister's LeapReader to interact with the pages of a book, building her understanding of the relationship between the words on a page and the story it tells. While it may be some time before Holly can actively read, these early interactions with books as stories, or as games, are her first steps on the road to reading. The 30 Ways in 30 days guide is really designed for parents of slightly older children, like Lara. The 30 tips range from ideas for how to whet your child's appetite for a story, to practical tips on the best way to target reading material to your child's reading abilities. From ideas for writing letters to your child's favourite author, to completing themed wordsearches. This guide contains sensible tips for parents, whatever level of confidence you have in your own ability to encourage a love of reading and writing. One of the tips in the 30/30 guide from Leapfrog is to consider allowing your child to stay up a little later than normal, so long as it is reading time. This has worked very effectively for us with Lara. Yes, there are still nights when both girls will pester to watch another episode of their favourite TV programme but, more often than not, Lara will jump at the chance to have a special late night so that she can read a chapter of her latest book. Lara enjoys reading her Leapreader books as a special treat. Her reading has progressed so quickly that all of the LeapReader books are now well within her abilities to read unaided but she still enjoys the magic of having a story read to her, and certainly enjoys the interactive puzzles that feature in most of the LeapReader books. This Doc McStuffins LeapReader book is designed for slightly older readers to read on their own and Lara has seemed as happy reading the story with and without her LeapReader. For us, a story (or six) at bedtime has become part of our family routine. However tired or stressed we all are at the end of a long working day, we all enjoy the wind-down of a story with the girls. But for many people, last thing at night isn't the greatest time for a story; as parents we shouldn't feel that reading opportunities are restricted to the traditional bedtime routine; one of the great 30/30 tips is to find a different regular reading time that suits your own family. Perhaps first thing in the morning, or immediately after a meal? You can find out about the LeapReader, the 30 Ways in 30 days parental guide and other Leapfrog news on twitter and facebook.